Ping Chen was born in 1962 in China before moving to Tasmania in the late 1990s. 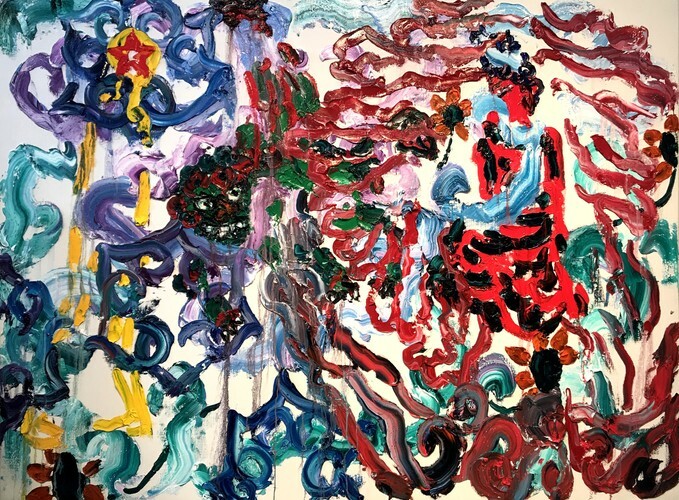 This body of painting, created between 2007 to 2018, show the shift in Ping’s work from the depiction of real stories, to mythological creation and artificial realities. The progress in his work reflects a change from painting using Western methods of figure construction to a more Eastern ink approach of liner drawing and folk-art patterns. While exploring the idea that painting could be relaxed from conceptual seriousness, to free spirit, to congregations of motifs and symbols. The latest series of paintings, Ladybird’s Garden, led by a ladybird, a young lady with a colourful patterned face and often featured wearing a flowery long dress, wanders in a heavenly garden. The garden it is full of clouds, flowers, Eastern idols and ancient architectures. Although the paintings continue Ping’s painterly style, the brush marks are sometimes flatly defined and loosely textured. All these brush marks represent certain patterns which carry meanings from both Eastern and Western cultures. For example, some flower patterns are taken from Christian churches and Rococo designs, others from Islamic and Asian decorations. Cloud and animal patterns are also typically Eastern in appearance. These create complex narratives of tensions, surprises and beauty across cultures and time.